We welcome business and leisure guests alike with modern services including free WiFi and spacious meeting facilities. Need a bite to eat? The BISTRO is your destination for refreshing breakfast choices in the morning, and a variety of dinner and cocktail options in the evening. Relax at our communal tables with friends or colleagues, or cozy up in one of our media booths for personal quiet time or that last-minute meeting. 1528 sq feet, drop down screen and flying projector on both sides. Access to outdoor courtyard with pergola and firepit. Can seat up to 150 in reception style. The Courtyard Dallas South Arlington was a great venue for a meeting. I work for a company called Stores Online, and we needed a large meeting room to accommodate about 80 people. I called around looking for several different venues and finally came across this place. The sales people were really friendly and very informative. The meeting room itself was the lowest price for what they were offering. They had a full service staff on board waiting to help us with anything we needed. The front desk was great at greeting our clients. They treated everyone with respect and they were very friendly. Aside from the staff, the building is very nice. It was a very classy hotel and it had a great ambience around it. 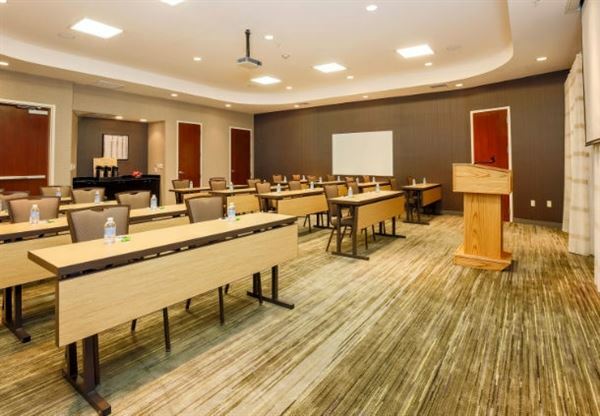 I would definitely recommend The Courtyard Dallas South Arlington hotel to anyone for a meeting venue in the metro area. The location was great as well. We needed something to be able to accommodate folks throughout the greater metropolitan area, and Arlington was a perfect central location. We go to Texas very often, and this was the first time we have stayed at the Courtyard Dallas South Arlington, but it definitely will not be the last. We plan on coming back many times, and again, I would definitely suggest that you use their services as well. It was a great price for such a friendly and helpful staff, and outstanding property, and perfect location. A definite plus. Courtyard Dallas South Arlington is the way to go. Special Features: The entire hotel was renovated March 2016 and includes a fitness center, outdoor pool in a private courtyard with firepit and gazebo. Sanctuary for weddings, 2 newly renovated banquet halls and kitchen.